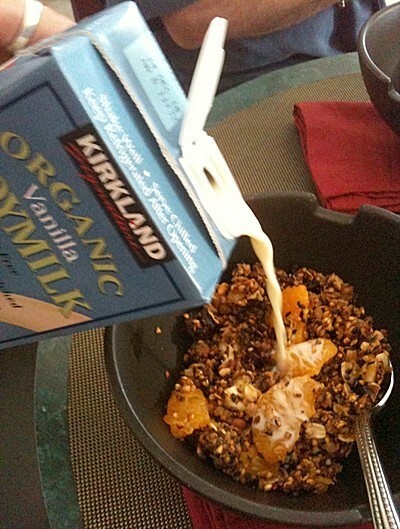 Granola is great to eat with milk or yogurt for breakfast. Making your own granola is easy to do. 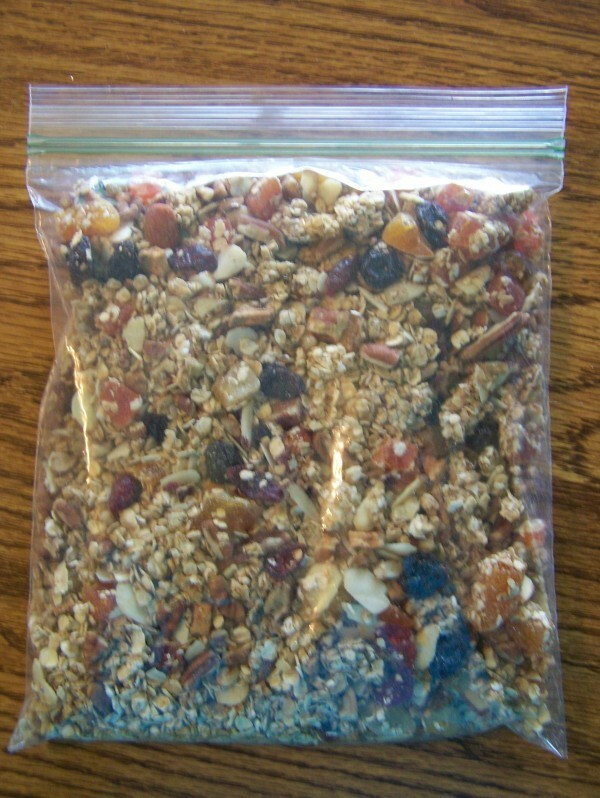 This is a guide about making your own granola. 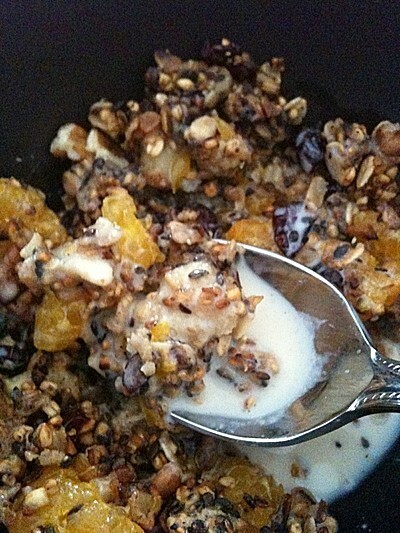 This is a fruit filled, quick granola. Makes around 12 cups. Simmer the apple juice, brown sugar, spices, and salt for 3 to 5 minutes until the sugar melts. Pour it over the oats and stir well. Spread on cookie sheets covered with parchment paper. Cook 10 minutes at 350 degrees F, stir, then shut off the oven, leaving the pans in the oven until the oven is cool. When it is cool, just pick up the parchment paper and make a funnel out of it to pour your granola into your containers for storage. It makes a pretty gift, wrapped in clear bags tied with a ribbon. Include the recipe, because you will be asked for it. Mmmm good! Crunch your way to good health! A healthy, high energy, protein and vitamin rich snack. It requires just a few moments a day to devour with a cup of steaming java or cool juice at your favorite Cafe. This is what I observed when watching Ruthie make this in my kitchen, so all amounts are approximate. Make your own version and share. Recipe can be cut in half. Start with a large, Teflon type frying pan, using medium to high heat, do not add oil to pan. Add both types oatmeal, seeds, pecans, coconut, and toast and toss until a very golden brown, being careful not to burn mixture. After all ingredients have been added, turn down heat and simmer for approximately 20 minutes or until apples are tender, but not mushy. This is best served warm with just a little but of Almond Milk in a bowl. Leftover can be kept in refrigerator for 7 - 10 days. Can also be eaten cold, as a snack, but I prefer it warm with milk. I store mine in the refrigerator in individual small glass bowls, heat briefly in microwave, and enjoy. Mix dry ingredients in a large bowl. Mix liquid ingredients in another bowl. Mix dry and liquid ingredients together. Bake in 350 degrees F oven for 50 minutes. Stir every 5 minutes. Enjoy a warm breakfast by yourself, with your family or even with guests when you keep this deliciously filling granola on hand in the freezer! It's also a great way to get your grains for the day. 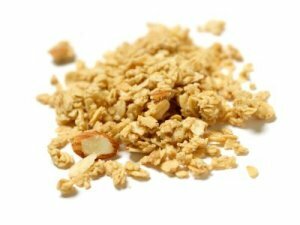 Homemade granola is quick and easy to make, is much better for you than most store-bought granola, and can be eaten as cereal or out of hand. Kids really like it, too. This is a great, healthy snack for your whole family! This is a great, healthy start to the day! I like it best for breakfast, but it is also a great, healthy snack as well. In a large bowl, combine the first nine ingredients; set aside. In a small saucepan, combine the honey, oil and vanilla. Cook over low heat for 1-2 minutes or until heated through. Pour over oat mixture; toss to coat. Granola is a healthy snack and is easy to make. It can be used to top yogurt, ice cream, or can even be enjoyed on it's own. Combine first 5 ingredients in a large bowl. Stir well, and set aside. Combine honey and next 4 ingredients, and warm in sauce pan. Pour over oats mixture, and stir well. 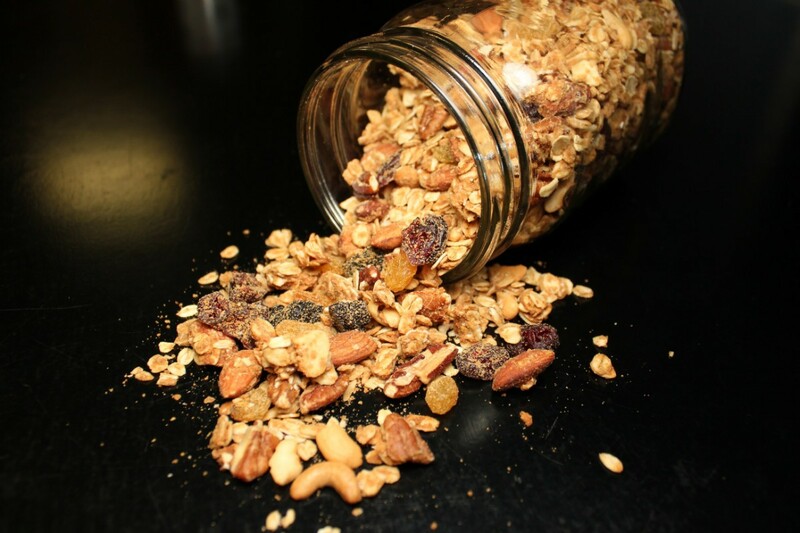 Great for breakfast with milk as a cereal or can use in a granola bar recipe. Does anyone have a recipe for granola? DON'T add them before baking, or your raisins will resemble bullets! Store cooled cereal in a dry, airtight container. Makes about 2-1/2 pounds. Adding more honey will make a sweeter product. Vary it to your taste with such things as raw, broken almonds or bits of dried apple. I usually double this recipe and it still only last a couple days. Combine these ingredients and mix with you hands so they are very well incorporated. Set aside. Stir this together quickly to it mixes as well as possible. Pour over the oat mixture and mix with a fork until all is moist. Pour onto a oil sprayed baking sheet and Bake at 275 for 30 min. stirring every 10 minutes to loosen and redistribute. At the last 10 minutes, you can add some shredded coconut. When finished and as it is cooling, stir occasionally or it will set up into chunks. Its better as smaller pieces. You can also add raisins, nuts, other granola ingredients. 1 c. your choice: raisins, dried blueberries, dried cranberries, ect. Preheat oven to 250 degrees. In large bowl, combine oats, nuts, coconut, and brown sugar. In another bowl, combine maple syrup, oil and salt. Combine together and stir. Pour onto 2 large sheet pans. Cook for 1 hour and 15 minutes, stirring every 15 minutes. Remove from oven and transfer to a large bowl. Stir in raisins or other dried fruit and mix until evenly distributed. Store in air tight container. Good as a breakfast cereal or as a snack! This page contains a maple peanut butter granola recipe. Making your own granola allows you to play with your favorite flavor combinations. 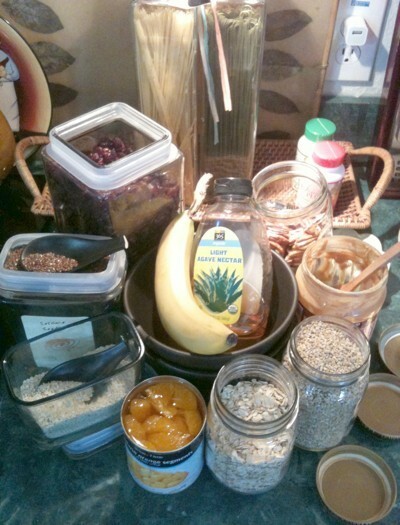 In my home a container of oatmeal is used for more than making a bowl of porridge. 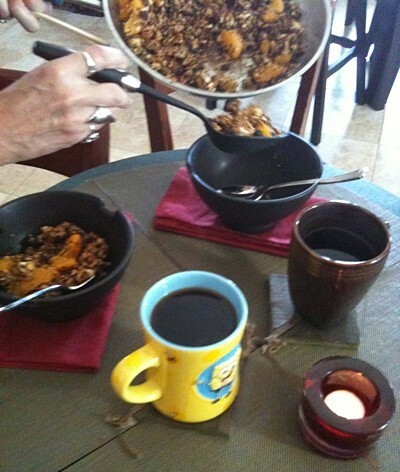 A portion of it makes granola, which is a good tasting, anytime, inexpensive, and healthy food to make. Just make a syrup using about 1 1/4 cups canola oil, 1/3 cup maple syrup, and 1 1/2 tsp vanilla. 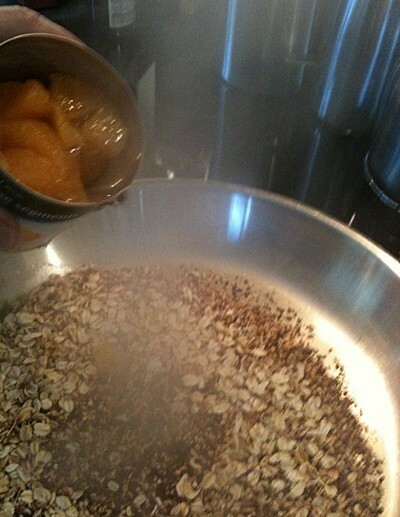 Mix and pour over a dry mixture of 2 cups instant or old fashioned oats and a 1/2 cup of chopped nuts. Mix all well, place on a baking sheet to bake for about 20 minutes at 350 degrees, allow to cool and add raisins or apricots. Enjoy! Frugal Tip: I recycle my finished raisin bran bag by tapping out any crumbs left behind and reuse to store my granola which finishes quickly. Granola can be good for you but NOT with 1 and 1/4 cups of canola oil and 1/3 cup maple syrup per 2 cups of oats. You're eating almost as much non-beneficial oil as you are eating oats! You wouldn't eat french fries or fried chicken that absorbed OVER half their weight in oil and call that healthy. Is the recipe correct as posted?